I have always wondered why my Grandmother Christina Sterland Lee (1901-1984) was called Christina Sterland and where her unusual middle name of Sterland came from. Then when I began to research the McGregor Sisters, I realised that she had been names after her Aunt Christina Sterland (nee McGregor).17th May 1901. Sadly Christina Sterland (nee McGregor) passed away at the tender age of 30 on the 17th May 1901 and my grandmother was born only twelve days after her death (29 May) and her sister Catherine Lee, still in mourning, named her new baby daughter Christina Sterland Lee. Like her sisters Christina was born in the mining town of Araluen in the Braidwood district of southern New South Wales. Soon after her birth James and Margaret McGregor moved their family from the gold fields of Araluen to try their luck at a little further away at Bombay on the Shoalhaven River. During the 1870-1872 times in the gold fields of Araluen had become quite tough. Little gold was found and many families moved on to different areas. This may have been the reason that the James McGregor decided to move his family to Bombay Creek. Christina would have been eight years old when the family finally moved to the Sydney suburb of Balmain. In 1892, at the age of 22 Christina married a widower, Mr Thomas Arthur Sterland, who had lost his first wife of five years in the previous year. Christina and Thomas lived in Thomas's greengrocer store on the corner of Darling Street and Nelson St, Balmain and Christina became step mother to Thomas's small son Albert. 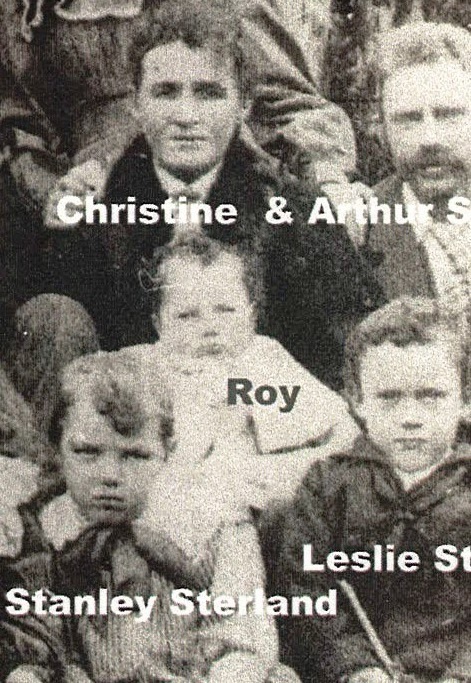 Christina and Thomas had three children of their own, Leslie, Stanley and Roy. The photo above shows the children and their parents. Tragically, in the year after this picture was taken Christina passed away leaving Thomas with a young family of four children to look after. Christina's funeral left their home in Balmain for the "Field of Mars Cemetery". I recenly visited her grave which is next to the grave of her parents James and Margaret McGregor. It must have been a shock to Thomas and the McGregor family to lose a wife and sister as such a young age. In the space of fifteen years Thomas has lost two wives and baby from his first marriage. Thomas remarried a couple of years later to Sarah Parks and they remained married until he passed away in 1954.